On and off. It’s my place of return. It’s the place I come back to when I can’t think of anywhere else to be. Also my daughter lives on the Gold Coast and has two children 12 & 14. After raising a generation and a half of children I feel like I can finally leave home myself. They have been too precious for me to do anything like leave. The feeling you can now leave home. Is that something that triggered your desire to begin writing? Well, I’m a journo by trade. I stuck my foot through a window… I was really angry… directionless and angry. The kids were at primary school and didn’t need me as much, so I went up to the college of advanced education and spoke with a careers counsellor. We checked out the courses on offer and I decided on journalism… so I did that for three years followed by a fourth year as a cadet at the Adelaide Advertiser. I was the youngest cadet at the Advertiser. When we came to Lismore, I worked at the Northern Star and soon after was made editor of a new lift out section called ‘Pizazz’. It was a women’s magazine – If women said it, did it or thought it, I’d write about it. The women of Lismore loved and supported that section and it went on to win the not insignificant ‘Harry Bud Memorial Award’ after we dedicated all of the August 1992 issues to a series on sexual abuse of children on the North Coast. Pizazz ran for three years but unfortunately folded when I left. It didn’t appeal to the advertisers. Doug Parrington was the editor and he fully supported it although he did pull me into his office occasionally and say “Steph, put in a recipe!” So I would put in a vegetarian recipe. Oh it was fun. Not surprising, given my radical feminism. 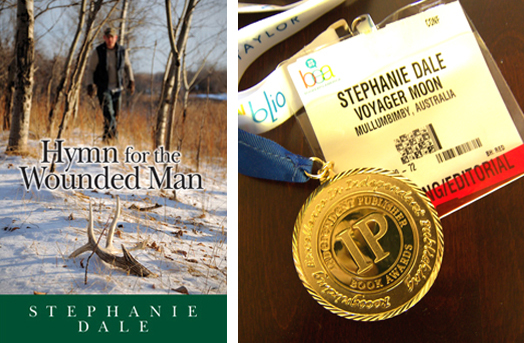 Stephanie surrounds herself with books and small momentos to keep her inspired. The Pizazz pages certainly sound like an achievement, but how did you make the transition to creative writing? I didn’t start writing creatively till I was 45. Writing was something I thought you did at school, but one day I was lying on the couch and had a thought to just get up – pack the car, sell my house and learn to write. And so I did. I was living on Mt Springbrook. The kids had been gone for nearly ten years, and I hadn’t found direction – I was completely treading water with my life. After selling the house I began house sitting and learning to write creatively. I had to unlearn my journo craft and learn to use adjectives… it is a completely different skill. I spent three years just mucking around and getting bits of novels. Then, at 48, I got married. That was a shock to the system. Since I hadn’t been married before I wasn’t aware of the ‘invisible dynamics’ of marriage and found myself buckling under the weight. Meanwhile, my son was about to commence a walk from Canterbury in England to Jerusalem in Israel. He had been out travelling the world for ten years and this was his swansong to life on the road, so I decided to join him and walk off my confusion of my marriage. I went to Rome with him and walked through Italy and over the Balkans, finally returning to Byron to write my first book My Pilgrim’s Heart. That whole book sat above my head and all I had to do was type, which is what I did for ten months in a house out on Main Arm Road (Mullumbimby). The second book Hymn for the Wounded Man was the book I had always wanted to write. It is a story based on my experience of living with a hunter in New Zealand, an extraordinary man so aligned with the forest. I wanted to write about what it was like to follow a hunter into the forest and participate in hunting deer and boar, which as a vegetarian was totally out of my reality. It proved to be a smart move writing the first book and commencing the second before starting the publishing journey. I didn’t know what I was going to do from a publishing point of view but I did know that I wasn’t interested in approaching publishers who didn’t want to know me – that would be too distressing and draining. Then one day whilst skiing in New Zealand, the Voyager Moon logo came into my mind… you know the boat with the moon above? I get a lot of positive feedback on that – most people think the boat is a ‘V’ and an ‘M’ joined together. Either way, I love it. When it appeared that day, I knew I would self publish. I didn’t do any planning, I just asked myself ‘what do I need now? Ok I need my book edited’… so I Googled editors. I looked at the top three Google listings and went from there. There are endless amounts of research one can do but it doesn’t get you started. I followed my impulses, Googled and ended up getting a great team together. You’ve recently been to New York. What took you there? After seven years of living on impulses I’ve become very attuned to it. In June this year it was as if the ‘God Force’ tapped me on my shoulder and said ‘New York, now!’ So I booked my ticket and shortly after discovered I was to receive a gold medal at the Independent Publisher Book Awards the night after I arrived in New York. Six months earlier I had entered Hymn for the Wounded Man and lo and behold, it won Best Fiction Australia/NZ. 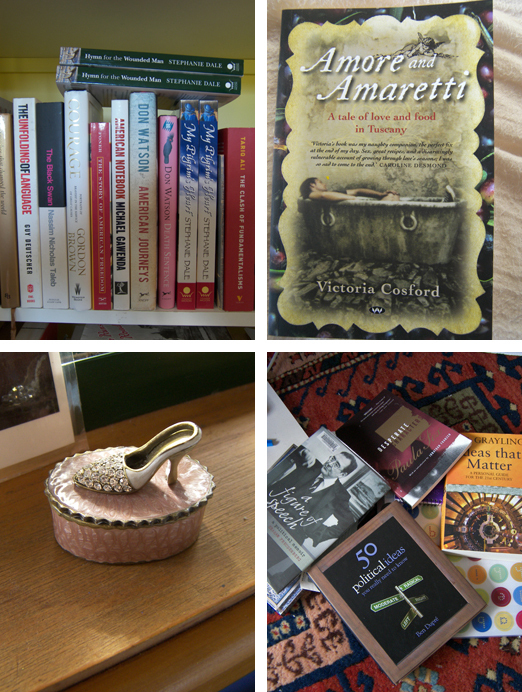 The New York Book Expo was on after the ceremony – clearly I was meant to be in NY. 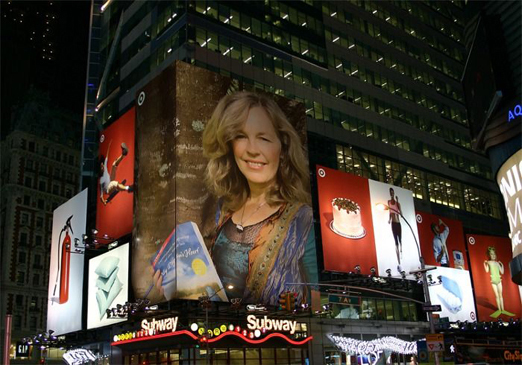 Promotional postcard for Stephanie’s recent trip to New York. Putting on the bright lights! Your first print run consisted of how many books? Because I didn’t have a 1000 friends and family members, I figured that many would enable me to gauge the market potential. It transpired that they all sold in four weeks. It was a miracle. Of course it’s much cheaper to print 5000 but I didn’t want a garage full of books flashing ‘Failure…Failure’. I wanted them to move. It’s just static energy. I think it messes with your energy field when things become stagnant. Things need to move. Everything needs to move. It sounds like this has become a way of life for you – paring everything down. You seem to be constantly exploring and expanding the edge of flow. Is that true? I am. I am at the edge of my own existence. One thing I’ve learnt to do over the last seven years is no wishing or wanting. If I’m doing this, I pay attention, because I find it’s energy draining not to. Another way of saying that is ‘no outstanding business’. I would love to go to Alaska and hang out with the reindeer people, but its not a wish or a want, as its not nagging me. I just know there will come a time when it will enter into me. But I had to seriously check that out in myself… in other words… do it or drop it. It’s exciting. It brings me into being totally committed to the creative force. I think if women were totally committed to the creative force it would resolve so much on this Earth. And our families and children are part of that creative force. For me now, nothing is more important than that creative force. 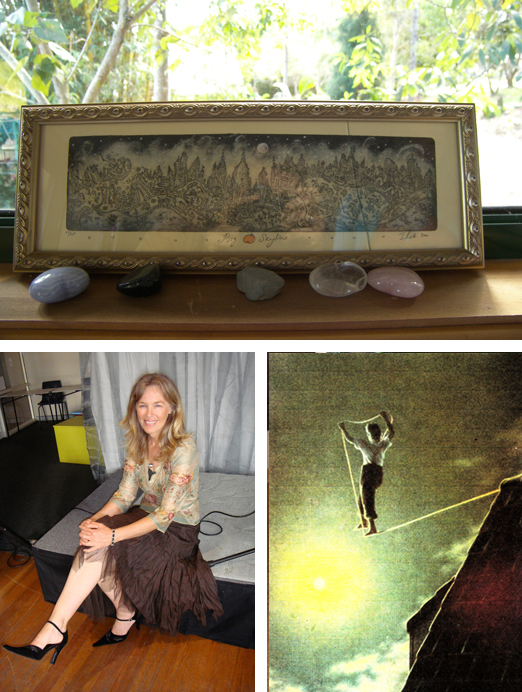 Can you elaborate on women being committed to their creative force? We would just be doing what we love. What’s left to say when you are doing what you love? We would not be picking a fight with our neighbour. Who’s got time for that? We are lovers. If you encounter something difficult you meet it from that place. You ask… is this good use of my time or energy, or have I got other things to do? There is such a thing as fighting the good fight, but it’s not just yakking. For example, I consider this area to be the ‘No’ capital of the world. Look at the Echo… there are ‘No’ stories everywhere. We always start with ‘No’… we fight against council and community. We have an entrenched ‘No’ story going. These petty fights test us to stay on track with our creative force. I know some of these issues matter, but if we were lovers we would be addressing them differently. We would be honouring one another rather than taking an adversarial stance. How does that relate to this area apparently being a feminine energy? If we look through that lens, then this area is the corrupt, angry, bitter female energy. It’s the one that’s not loving of others and herself, that’s wanting other people to do what she is not willing to do for herself. Sometimes I wonder if the victim mentality is not a hangover from the 60’s and 70’s revolutionary days when everything was a fight and there was an ideal new way of looking at things and people forgot to stop fighting. Their hearts were angry, and are still. Everything is ‘No’… as if the world is fucked! Hey its not. There is so much positive stuff going on out there. Above: Etching of New York sits above Stephanie’s bed. Below: Stephanie says ‘I am at the edge of my own existence’. So in contrast do you feel you have been to the ‘Yes’ capital of the world? Yes, New York City… but it’s not about comparing. We are not New York and never will be, however I think we can stop telling everybody what to do and just start living well ourselves. We are creating the very world that everybody is fighting is against, the one that is intolerant. We have these ideas that everybody but us is intolerant, un-environmental, fill in the gap… it’s sanctimonious crap, Do you know what I think the problem is? Ideology of any form. Ideology is dangerous. It is just an ideal that comes out of one person’s mind. It comes from the mind not the heart focus. It’s some angry person’s idea of what needs doing. It’s ok to have ideals just as long as those ideals don’t transfer into an ideology and then apply to others. When we start telling other people what they can and can’t do. Would you like a muffin? So the challenges of living in this area for you is the ‘No’ factor… what are the joys? The food. The food choice. It is such a privilege to be able to choose the range of food we want to eat. And I love watching people get creative with how they can make a living in what is essential a regional area… the olive growers, cheese makers, organic gardeners. And of course, the mountains and the ocean. Byron has always been a beautiful place. 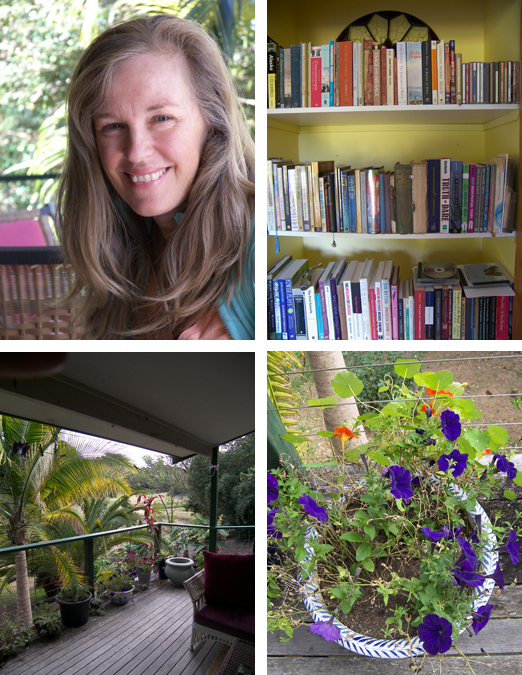 Stephanie in Byron – a place to return. As always…. It’s often our first impressions that last. As we were closing the conversation, Stephanie excitedly remembered how she first came to Byron… “When I was 18 and pregnant I was driving from Canberra to Brisbane… the old highway days… and Jonathon Livingston Seagull was playing on my tape recorder. I was driving on the back road from Bangalow to Byron through the lush green hills. It was late 70s and with the music playing it felt like I was entering a kingdom. Then I discovered Supper Time Blues café, the original vegetarian café in Byron. For years later I would time my drive from Canberra to Brisbane to call into Byron Bay to camp on the beachfront in the dunes and have coconut pie, veggie burger and a banana smoothie. That was my travel food. And the reason I camped was so I could wake up and have it all again the next day. (LOL) I would drive a 1000 kilometres for a coconut pie, veggie burger and smoothie. There were not a lot of vegetarian cafes in Australia in those days… It’s making me realise what it is about this area that I love. I have a long standing relationship with it but sometimes it really annoys me. And yet… It’s my place of return.” Needless to say our time with Stephanie was invigorating and thought provoking; her honesty and consideration when expressing her perspective was palpable. She strikes us as a woman who is here to shake the tree a little. Her love/hate relationship with Byron Bay is a perspective we feel sure others can connect with. And above all else… we too find it’s a place where we choose to return to. 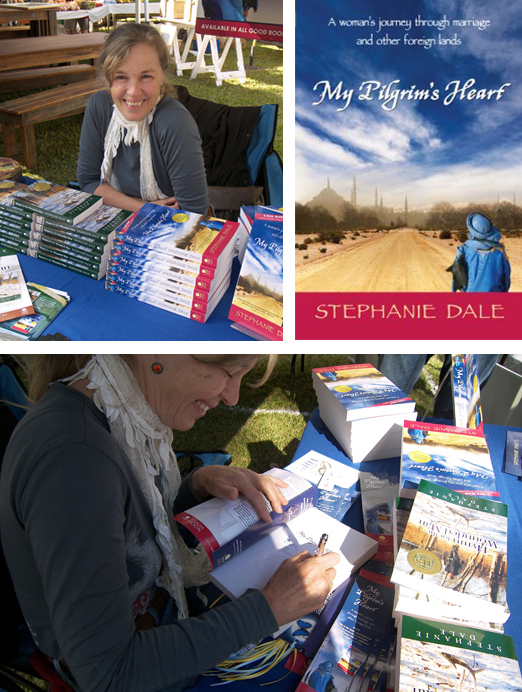 If you would like to read one of Stephanie’s great books – My Pilgrim’s Heart or Hymn for the Wounded Man – just leave a comment on this post by COB Friday 19 August and we will select two lucky winners at random and advise them by email on Tuesday. (Giveaways are open to Australian residents only). 1. What’s your favourite Byron café? Targa. I love their gorgonzola gnocchi. 2. What’s your favourite thing to do in Byron? 3. Is there any one person who has inspired you in this area? Patt Gregory (Woodwork for Women)…she is the one person I know who is doing what I am doing in her own way. The moment I laid eyes on her book I knew I had met a kindred spirit. 5. What’s your favourite blog/web site? 6. What’s your favourite shop? The local markets. I’m really saddened by the loss of restaurants in this area due to the down turn of quality in restaurant food…Dish has gone, Fins has gone, Olivo’s has gone. 7. What’s your locals tips for visitors to this area? So agree with Stephanie on the NO mentality that pervades our community. Very true words. Thanks Fi… Stephanie certainly gave us some things to think about. Its easy to become unconscious in this land of paradise.